On this episode, African wildlife biologist Bill Given talks about his mission to shake up the safari industry. Bill says too much of the money travelers spend on safaris is going to outside companies in big cities and foreign countries. He’s partnering with three unique safari camps – in Botswana, Kenya, and Tanzania – in an effort to encourage local residents in rural communities to be directly involved in the ownership of camps that operate in their areas. Bill explains why he thinks this is so important. He also shares tips on how to choose the best places to go and the best time of year for your first African safari. Also on this week’s show, a tribute to a heroic African musician. After decades of song-and-dance-fuelled political activism in South Africa, Johnny Clegg is about to play his final concert in his adopted homeland. 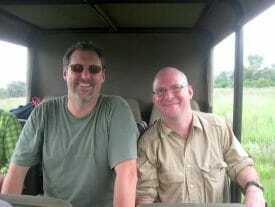 Bill Given (left) and Dave Fox traveled together in 2010 on a Safari through the Okavango Delta and Kalahari Desert in Botswana. Bill, along with a team of local wildlife experts, led game drives, and Dave taught a series of travel writing workshops. Bill Given is an African wildlife biologist and founder of The Wild Source, a safari company based in Colorado in the United States. Kenya: Enaidura Camp in the Maasai Mara. Tanzania: Njozi Camp in the Serengeti. Botswana: Bushman Plains Camp in the Okavango Delta. 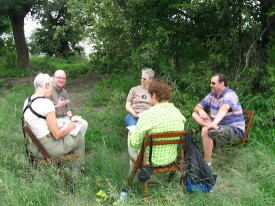 Dave teaches a writing lesson in Botswana’s Okavango Delta. Interested in a travel writing safari with Bill Given and Dave Fox? If you can organize a group of six aspiring writers (all skill levels welcome! ), they can custom design an African writing safari based on your prefered dates and destinations. For more information about writing safaris, e-mail Dave. 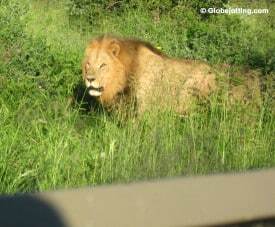 For more info on general safaris, visit thewildsource.com or contact The Wild Source. After decades of musical activism in South Africa, Johnny Clegg has announced he is retiring to spend more time with his family and finish writing his autobiography. Clegg was diagnosed in 2015 with pancreatic cancer. Visit Johnny Clegg’s official website at JohnnyClegg.com. Johnny Clegg has three concerts scheduled in Port Elizabeth, South Africa on January 26-28, 2018. Get tickets here. Learn more about Johnny Clegg’s life, his music, his political activism in South Africa, and his two bands, Juluka and Savuka, on his Wikipedia page. “Asimbonanga” was dedicated to Nelson Mandela. In a historic concert in 1999, Clegg performed the song for Mandela. When he was finished playing, Mandela came on stage, told the audience they needed to be dancing more, and then asked Johnny Clegg to play the song again with more audience participation. Watch a video of that historic performance below. Stories, Interview Guests, and Travel Questions Wanted!